Office-Politics » Are you the best person to be the manager? 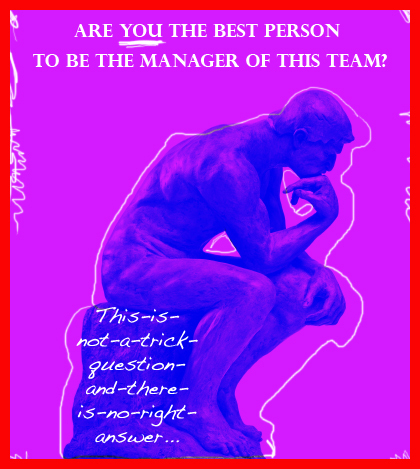 Are you the best person to be the manager? I have just been hired as marketing manager of a team of 8 in a finance-related company. This is my first team leader experience. I have 10-years very generic experience in marketing, in various industries but not that one. One member of my team was hired only 2 months before me. She has as much working experience and equivalent diploma as I have, and she is also more skilled than me in finance. She has previous team managing experience and knows some marketing techniques I have not yet mastered. Basically, she could perfectly have been hired at my position. The main reasons, I think, why I got the job are because I can speak more languages, which is an essential issue in our market, and my manager appreciates some other soft-skills I have such as diplomacy. He knows that I am new to that market, that I am no technical guy and that I have no management experience. He also appreciates my team member’s very good work. Recently, that team member came to me to explain she was not satisfied with the situation, and wanted me to show I deserved my position. She questioned some things I had done and, indirectly, my lack of experience as team leader. I recognized the mistakes done (there were some), said I was sorry for any misunderstanding that might have happened and tried to sound positive. There were other people listening, as we are in an open space. She has great freedom to manage her projects, and I accepted some proposals she made regarding some items I was working on (e.g. marketing plan). On the other hand, I do not want to be seen as a “nice but not so competent” guy. As far as the rest of the team is concerned, the first weeks had been quite difficult but, in speaking with some of them and accepting their constructive criticism, I managed to get on well with them and to build good and efficient working relationships. I do not want this to be destroyed because she also has good relationships with the team. She threatened to speak about all this with my boss with whom she is in regular and good contact (she probably already voiced her concerns) and, if things were not going better, to go elsewhere. I know she could easily find a new and probably better position, but this would be a blow to me if I do not manage to work with her. What I intend to do now is to try and focus more on my job (even though she is constantly screening everything I do) but also invite her to lunch to discuss in a friendly atmosphere how we can arrange the situation. I also intend to talk about this with my boss in some neutral manner, but I do not want him to question my competence as well. It is just that I had loads to learn in very short a time, and I do not want everything to be wasted now that things were getting better. Which actions would you suggest? A very complex and delicate situation, no doubt! There are a couple of things I want to suggest, but I think your first challenge is an internal one. Along those lines, let me ask you a question that may seem odd: Are you sure you’re the best person to be the manager of this team? This is not a trick question, and there’s no right answer. However, if your answer is no, I’d say your odds of succeeding in the job are pretty low. Your colleague, who is making no bones about the fact that she wants your job and believes she should have it, will easily sense your lack of certainty and capitalize on it with everyone around you. Your boss will sense it and may start second-guessing his decision to give you the job. Your other reports will sense it, and wonder whether you are the right guy to be their boss. 1) With your boss: go to him, and let him know that you’re aware that your colleague isn’t happy with the situation, and that she has come to you about it. Tell him – not in an arrogant, bragging way, but with quiet self-confidence – why you think he made the right decision giving you the job (work off your list! ), and outline for him your plan for making best use of her talents and being a good, supportive, strong boss for her. 2) With your colleague: go to her and let her know that you’ve had a good talk with your boss, and that he’s aware of the situation, and that you’ve shared with him your plan for making best use of her talents and being a good, supportive, strong boss for her. This removes any leverage she may think she has over you about “going to your boss.” At the same time, as you speak to her with the same quiet confidence (mentally reflecting on your list as you speak with her), it will make it clearer to her that you are the manager, you feel confident being the manager, and you’re not at all worried about whether you’re the “nice but not competent” guy. 3) With your team: when you meet with them, continue to use all your skills of diplomacy and listening and all the marketing expertise you’ve acquired over the years. AND, before every team meeting – read through your list. When you meet with your team, you want to exude that same quiet confidence that you are the exact right guy to be managing them, that they’re lucky to have you, and that with you as team leader, they’re going to succeed and enjoy doing it. Thanks for writing to OfficePolitics.com. For starters if you doubt yourself and think that you shouldnt be doing the job then it will definitely show and other will pick up on it. If you dont believe in yourself then no one will. Also in terms of your fellow co-worker who you feel is more experienced then you, well she might be but you cant let that discourage you because you got the job. Try to use her as a tool. Even if your not the best at a specific job and there is others who can do it better, a good manager can and does acknowledge there short comings and uses other people under them to offset that. Dont exclude her, use her! Use her mind for the job and learn from her. Once we stop learning we truely mess things up. We must always be ready to learn new things and listen to what others have to say.